Introducing our exclusive hand-painted canvas by JP Needlepoint. The design is 11” x 11” on 13 count canvas. It comes with a stitch guide by Nancy Yeldell. 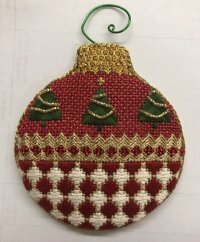 This design will be in the November/December 2018 edition of Needlepoint Now. The canvas and stitch guide are $170. Call the shop to reserve yours. On Friday, November 23rd Janice Doxey will be teaching a Whimsy & Grace painted canvas ornament from 10 AM to 4 PM. The painted canvas, stitch guide, decorative hanger, all necessary threads and beads are included in the price - $88. 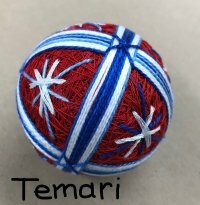 This design is great for stitchers of all abilities. Registration is open now through November 1, 2018. Call the shop to reserve your space. Starting in December, we will be teaching the basics once a month. We’re calling this series A Fresh Start. Each three-hour class is $40 and includes all materials required. Class size is limited to 10 participants. Class time is 10 AM – 1 PM. If there’s a technique that you want to learn, let us know. We’ll add it to the Fresh Start Series. 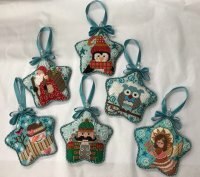 Our new club for 2019 features Star Ornaments by CH Designs, distributed by Danji Designs. 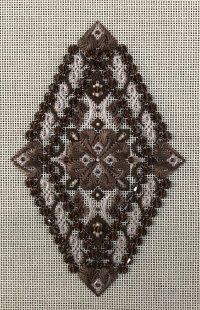 Approximately every six weeks, we will send you a new canvas with stitch guide by Nancy Yeldell, threads, and beads. Each month’s selection will vary based upon the threads that come with it. If you opt for the canvas and stitch guide option only, it will cost $52.00. 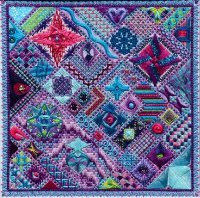 Lorene Salt will teach Spring Kaleidoscope on January 19 & 20, 2019. This is an amazing intermediate-level counted needlepoint piece. Lorene joined us in February of this year to teach the companion piece, Autumn Kaleidoscope. Her teaching style is very informative and hands-on with plenty of time to execute the stitches she is teaching. Non-refundable deposit of $100 is due by November 15, 2018. Total cost of the class is $275 and includes the canvas, beads, threads, instruction, and lunch. Class will be held from 10 AM to 4 PM. If you are not able to attend in person, we are allowing people to “ghost” the class. In lieu of lunch, postage is included if you are ghosting. Our summer project has been so popular, we decided to bring it to January. The fourth Saturday of January, February, and March we will debut our Winter Project: Threedles design, Crescents Only. The pattern is $24. The threads you choose will determine the final cost of the project. The total price for the model was $94.00 and included Elegance, Princess Perle, Petite Silk Lamé, Kreinik #8 Braid, Sundance size 11 beads (two colors), and 4mm Swarovski bicones. Charli pulled several color choices, but you are welcome to come in and pick your own colors. Charli included two choices of Swarovski bicones in each colorway; only one color of bicone was used in the model. 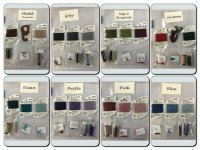 Her stash of Swarovski crystals is in the shop and available to look at for color comparison. Please come to the shop to see the colors in person - the picture is just for a general idea. As with all our classes and clubs, our out-of-town friends are encouraged to join us. Call the shop to register. We will have to order the Swarovski bicones. 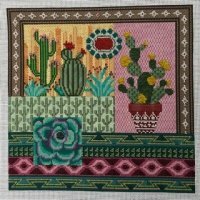 On Friday, April 5, 2019, we'll gather in Tucson, Arizona for a weekend retreat - our very own Stitching Escape. The fee for our Spring Retreat includes hotel room for 2 nights based on double occupancy and five meals throughout the weekend. Single occupancy is available at an additional charge. We'll have 24-hour private access to our Stitching Room, the Ironwood Ballroom; beginning 9 AM April 5, 2019. The cost for our Retreat is $575.00 based on double occupancy. The cost for a single room is $755.00. This includes two nights, Friday and Saturday, at the OMNI Tucson National Forest in well-appointed rooms. Meals included are Friday lunch and dinner, Saturday lunch and dinner and Sunday lunch. National Teacher JILL RIGOLI is joining us by popular demand. Jill is an avid leader in needlepoint. She introduced Laurel Burch designs to needlepointers through Danji Designs. Jill prepares a custom Stitch Guide for your chosen canvas. Threads recommended by Jill will be available for purchase. Canvas Embellishment with Jill is an additional cost of $135.00. For canvases not purchased at Old Town Needlework an additional charge of $30.00 will be due. Our weekend escape is becoming quite popular and is limited to 50 participants. · To secure your reservation, a non-refundable deposit of $200.00 is due by January 15, 2019. · To participate with Jill, your canvas must be received by January 15, 2019. · Payment in full for the Retreat and for Jill's Class is due no later than March 1, 2019.